At 0810 hours, Fleet Command received word that sensors had registered Borg vessels entering the Sol system. 210 vessels, mostly standard cubes were advancing directly towards Earth. Upon reaching the Neptune orbit however, they encountered the system's first line of defense. Thirteen ships had been working through the night to finish completion of a mobile minefield. Once activated, the minefield was able to cloak using Romulan technology, and was programmed to track Borg transwarp signatures. Should the Borg cross the programmed Neptune line, the mines would converge on the leading vessels and destroy them. Initially ignorant to the minefield, the lead Borg vessels quickly crossed the Neptune line and suffered heavy damage. 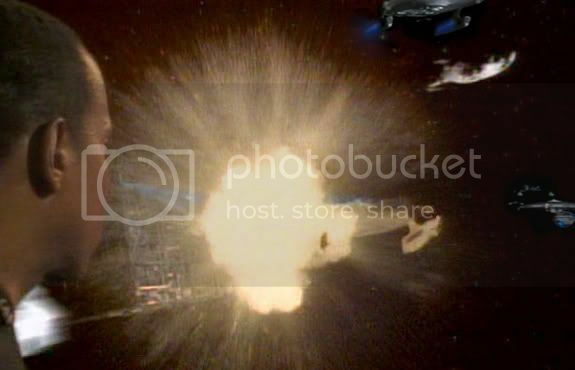 Analysis of sensor readings suggests that three Borg vessels were destroyed in the first incursion, with three more suffering near critical damage. Following these losses, the Borg spent two hours attempting to disarm the minefield. Though they were unsuccessful, they became aware that though the mines were mobile, they were limited in their speed and so the Borg would be able to circumvent the threat. Immediately setting course to skip the field, the Borg were ultimately held back for fourteen hours by the minefield and were pushed far off course giving the scrambling Allied forces time to finalize their formations. Though the minefield could not track the Borg fleet indefinitely, and was too slow to converge on the lead ships when they crossed the line, it was quick enough to attack the rear-runners of the invading force, and a further eight Borg vessels were destroyed. Following their experience with the minefield, the Borg advanced at a slower rate, taking time to scan the system thoroughly before proceeding. Though Sol's asteroid belt is neither particularly dense nor large, its innocuous presence allowed the Allies to hide a series of automated matter/anti-matter missiles within its area. The missiles were not detected by the Borg until they began firing, however the damage inflicted was less than the Allies may have hoped for. 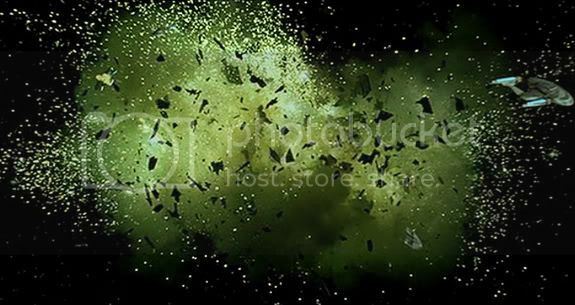 Only two Cubes and one Sphere were destroyed, with many others suffering only minor damage. The detour necessitated by the Neptune line meant that in order to reach Earth, the Borg fleet would have to pass almost directly past Mars, though with fighters and starships being grouped above Earth, the Borg faced a 'watered-down' version of the Mars Defensive Perimeter. Despite this, and having been thoughly re-designed largely to fight off Dominion vessels, the MDP was successful in destroying around twenty Borg vessels before it was neutralized. Strike Force Alpha was a large grouping of heavily armed warships, assembled as the main line of defense against the Borg. At 2130 hours, as the MDP was beginning to be overrun, a joint force of 1500 select Starfleet, Klingon and Dominion warships engaged the Borg in orbit of Mars. Specifically, a great deal of the initial combat took place in and around the drydocks and stations of Utopia Planitia, as the Borg not only attacked what remained of the Federation's ship building capacity, but attempted to break into the Federation Databanks and find the cure for the Dominion Pathogen that was still infecting the Collective. 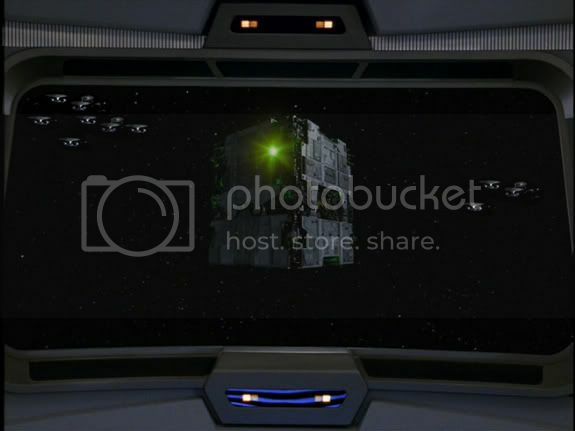 Eventually, the station that held the data was destroyed by Starfleet forces to subvert the Borg�s efforts. Though the Strike Force was largely made up of hundreds of ships specifically designed or retrofitted to fight the Borg, and inflicted comparatively heavy damage on the enemy fleet, they were eventually forced into a running defense as the Borg continued to push through towards Earth. 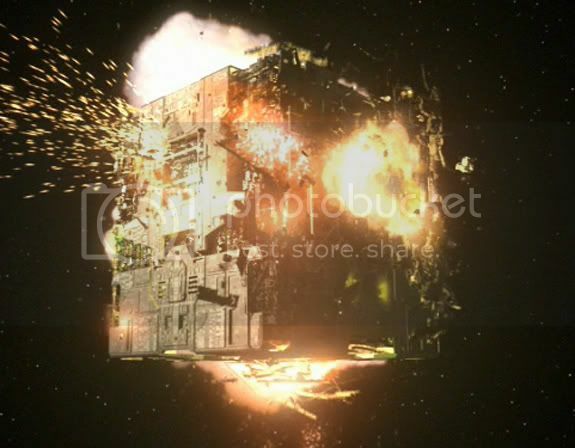 As the day ended, SF-A's commanding officer estimated that fourteen Borg vessels had been destroyed with many more being damaged. Just over one hundred and fifty Borg vessels were picked up on short range sensors by the Allied Fleet in the early hours of the morning. Still involved in a running firefight, Strike Force Alpha (with over 1000 ships still capable of combat) commanders quickly withdrew to the flanks as the largest wing of the main fleet, based around Space Dock One. These forces then opened fire on the Borg fleet with Romulan, Federation and Cardassian capital vessels leading the assault. 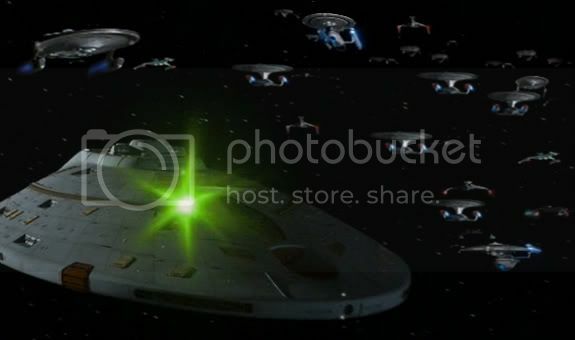 With previous attacks lowering the Borg number to around one hundred and fifty ships, the numbers favored the Allies and combat went as well as could be expected, with the numbers of losses for the Allies large, but "within the predicted margin for victory" as established by Starfleet Command before the battle began. Whilst the main battle went comparatively well for the Allies, a force of thirteen Borg tactical cubes approached from the far side of the system, unnoticed by fleet sensor sweeps which were focused on the immediate engagement. 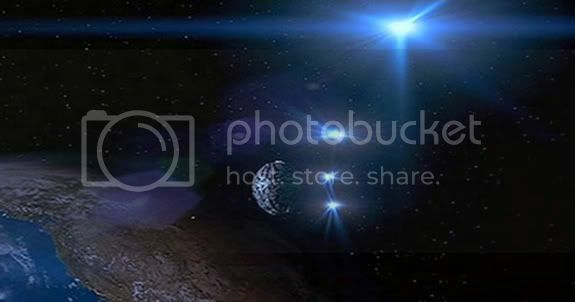 Approaching Earth quickly, they opened fire on the surface and tera'tengcha H; the Klingon armored star base that had been constructed upon the Empire's entry into the Federation and was orbiting the planet away from the area of combat. 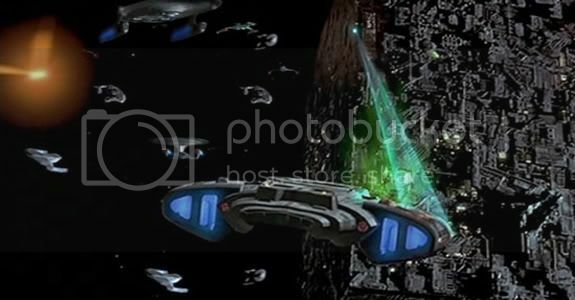 Because the station was left largely unmanned with its crew assigned to warships in the fleet, it was unable to put up a strong resistance to the assault, however ultimately survived because the Borg attack was focused on the surface, where they primarily but not exclusively targeted military installations such as Starfleet Command in San Francisco. The uncontrolled nature of the Orbital bombardment led to heavy civilian casualties in the targeted cities and surrounding areas, leading to a crucial break-down in formation for the Allies. Many of the Earth-based civilian ships serving within the fleet broke rank and moved to either engage the Borg in what turned out to be little more than suicide runs, or rescue family members from the planet's surface. This created a sizeable gap in the Fleet's lines, forcing the fleet to quickly regroup. The necessity of driving off the Tactical Cube wing however, meant that what remained of the front line was stretched thin with its back against the gravitational pull of Earth. 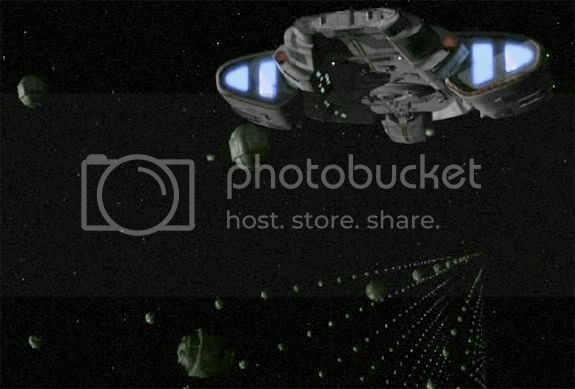 During this frantic period of battle, the immense firepower of the space dock proved to be key in holding the Borg fleet back, and was by responsible for a number of kills throughout the day. Late into the day, the force that had separated from the main fleet to fight the Tactical Cube wing rejoined the main fight, having proved successful in destroying most of the attacking force, and driving what remained away. 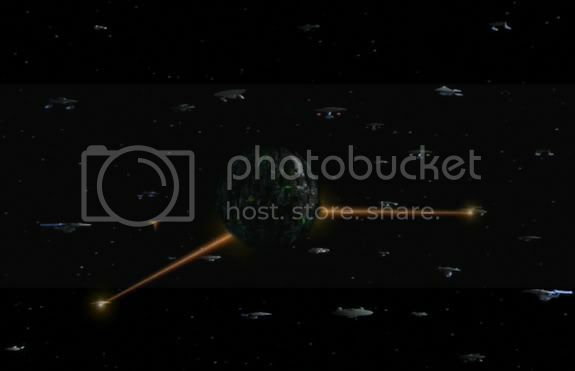 Despite this boost to moral and the drop in Borg numbers, the day's constant battle had left many crews fatigued, and so when the Borg launched a heavy attack directed towards the space dock, the Allies were caught briefly of guard, and though they fought late into the night, the base of Earth's defense was ultimately destroyed. At the start of the fourth day of battle, both fleets had suffered heavy losses. The vast majority of smaller civilian vessels serving within the Allied fleet had been destroyed, and the destruction of Space Dock One had necessitated a change in organization. Though fortunately, most of the vessels still capable of combat were the more advanced and combat rounded classes and variants, the total Allied fleet now numbered a severely reduced 2160 ships. 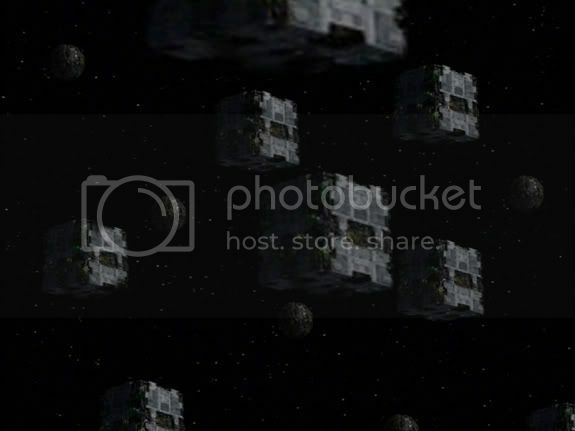 For their part, the Borg had lost all their Spheres, a great number of standard Cubes, and retained only two of the Tactical Cubes that had attacked from the rear on the previous day, totaling a combined number of just over sixty vessels. The Borg fleet had lost most of their numbers, however those that remained still proved effective against the Allies and over the course of the day, around six hundred of the remaining Allied vessels were destroyed. In the late afternoon, the result of the day�s fighting was obvious. The Allies now numbered just over 1400 vessels, the vast majority of which were Starfleet, Klingon, Romulan and Dominion. The Borg had been depleted to a force of forty two ships; a seemingly small number, but based on the battle's (and indeed, the war's) averages, more than enough to destroy the Allied fleet, which statistically, would have needed over a hundred extra ships to defeat the Borg fleet. Unexpectedly, at 1715 hours, the Borg fleet ceased fire and withdrew to beyond the Mars line in order to regenerate and repair their ships. Following frantic reorganization within the Allied Fleet, debate was rife throughout the evening and night as whether the Borg should be pursued and engaged or if Earth should be fortified. At 0300 on the fifth day of battle, Allied command eventually decided to actively attack the remaining Borg vessels. Unfortunately for the fleet, because the decision had taken so long to be agreed upon, upon crossing the Mars orbit they found the remaining Borg vessels had been able to repair themselves a great deal, certainly more than Starfleet had been able to, despite crews working constantly throughout the night. The two fleets collided, with the Allied group leaders keeping a tight grasp on their squadrons despite the seemingly uncoordinated nature of the assault to spectators. The Borg, holding off the attack began to advance once again towards Earth, entering weapons range by 0600. Even without the firepower of the space dock however, the Allies provided fierce resistance, with many damaged vessels diverting power from life-support to their weapons systems before being destroyed, some by final suicide runs into Borg vessels. The stubborn resistance proved effective, and the Borg began to lose their ships and the thousands of drones onboard them. Through the rest of 2388 and all of 2399, Federation forces remained close to Earth, and focused on rebuilding the Federation infrastructure. The Federation constructed several small orbital facilities to repair what remained of their fleet. On June 13th, 2399, the Federation officially reformed the First Fleet, or the Earth Defense Force, which was comprised mostly of the remaining operational ships which had held Sol. 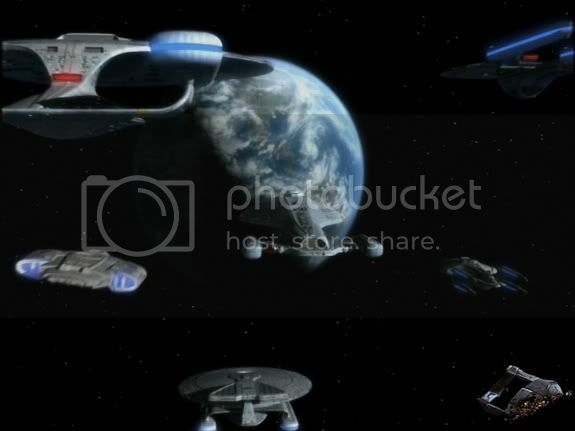 The Federation constructed a small number of new warships, as well as a number of orbital defense platforms. On January First 2400, the Federation officially declared victory over the Borg, and began a full initiative to rebuild the fleet. The members of the Federation vowed to push back out into the galaxy. 24 days after V-Day, the Federation received a broad spectrum sub-space message from the USS Cole; 23,000 personnel had survived attack on Unity 1, and fallen back to the DR-32 yards. It was revealed that the Federation had constructed a number of yards on Sector 032, but when contact was lost with the yards they were assumed to have been lost. A number of ships had re-grouped at the yards and survived the war. This discovery sparked forth a massive push to re-explore the Quadrant. With the influx of ships from DR-32, the Federation was able to re-establish the Third and Fifth Fleets, and launch a full Re-Exploration Initiative, to search for survivors under the command of Admiral Zuchov. 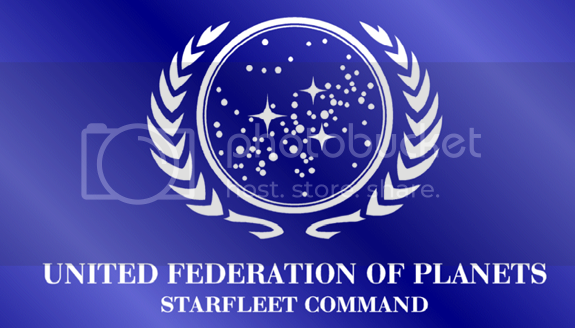 With these new programs under way, the Federation entered into an �Era of Good Feelings.� The Federation was stable, its relationships secure, its members eager to return to their home worlds, and its forces beginning to rebuild. The Federation had fought off their most powerful foe, and emerged victorious.